Along with a stand mixer and a food processor, a blender is one of the few small appliances that are likely to be worth the space they take up in almost any cook's kitchen. To earn that coveted spot in your cabinet, though (or—if it's really good—on your countertop! ), the machine has to purée sauces and soups to a velvety consistency, blend fibrous greens like kale into a smoothie, and turn rock-hard ice into snow for happy-hour frozen drinks. If you can spring for it, your best bet is a high-powered blender, like a Vitamix or a Blendtec—you can read our review of that category of blenders here. Their blending power is unrivaled, but, with prices starting at around $400, such blenders aren't a realistic option for many households. Our goal here, then, was to find a more affordable blender that delivers the absolute best performance for the price. We tested nine mid-priced models (between $100 and $275) to find ones that are capable across a range of common blender tasks. You probably shouldn't try to mill flour or make peanut butter in them—both jobs that high-end blenders can do—but otherwise, our top picks won't disappoint. The Cuisinart Hurricane started the testing by crushing ice, and by the time we finished, it had crushed in just about every other test, too. It scored high in each round, producing the smoothest smoothie, emulsifying a creamy mayo, and puréeing soup until nice and smooth. The design is handsome—none of that hulking commercial-blender styling—and the dashboard features a timer that automatically counts up when you start the blender, or can be set to count down and then automatically shut off. The KitchenAid kept pace with the rest of the pack, a respectable performance for the second-least-expensive blender in our lineup. While the KitchenAid was the quietest blender we tested, some user reviews cite durability issues with the plastic-covered gear that spins the blades—something we'll keep an eye on. At the risk of stating the obvious, the most important trait of a blender is how well it blends the ingredients you dump into it. We expect a blender to make smooth purées, soups, and sauces; mix frozen cocktails; crush ice; and emulsify mayonnaise. Unfortunately, no mid-range blender can compete with a high-end blender, like a Vitamix or a Blendtec. Typically found in commercial kitchens, these chunky, pro-style machines have motors pushing out peak horsepower of two or higher, which means they blend better, resulting in smoother soups, grit-free smoothies, and creamy nut butters. But those blenders cost a small fortune, which makes them off-limits for many home cooks. 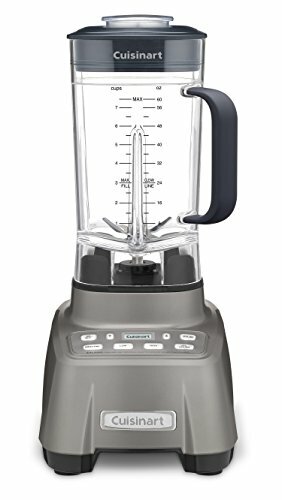 (Though, if you're looking to blow a wad of cash on a new kitchen acquisition, we'd fully support splurging on one—once you go high-end blender, you never go back.) 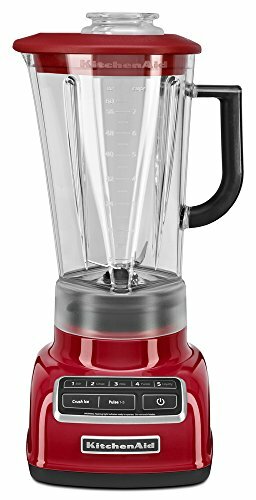 For more budget-conscious home cooks who want to blitz together a quick sauce or protein shake, and who don't necessarily need Michelin-star-smooth soups, a solid mid-range blender is what's needed. For these tests, we set a cap of $250 for each blender, but included one somewhat higher-priced, $275 model to see if we were missing out on any performance for the extra money. Most blenders come with a jar ranging in capacity from 56 to 64 ounces, though one model we tested had a 32-ounce capacity. About half of the blenders we included came with tampers, which allow you to safely push and prod at whatever is in the jar while the blender is running. This can help keep thick and stubborn foods moving instead of getting stuck, but only if the blender itself is doing a good enough job to begin with. In our search for models to test, we noticed reports on America's Test Kitchen (subscription required) and The Sweethome that described blender motor burnout due to frequent use, as well as plastic jars cracking after years of being run through the dishwasher. While we didn't fry any motors or break any jars during our testing, we'll keep using our picks, and we'll update this review if we notice any premature wear. When a blender is running, a well-formed vortex in the jar is what you need to pull food down into the blade for optimum processing. An efficient vortex is dependent on the jar shape, blade design, blade speed, and the quantity and consistency of the ingredients in the jar: It's easy to get a vortex going with something as thin as water, but as the food gets thicker (or as it goes down in volume), that can become increasingly difficult. Most manufacturers use blades that combine sharp, straight edges with serrated ones. Some brands use four blades, while others opt for six (often angled at different degrees), but our testing didn't reveal a clear correlation between any particular blade design and performance. Generally, it's easier to dial in a speed that gets a good vortex going when the blender has an analog speed dial (a tautology if ever we've written one). Blenders with discrete buttons, on the other hand, can make this more difficult, forcing you to choose between a speed that's too slow to form a vortex and one that's so fast that the food rides on top of the blades, instead of through them. While we tend to prefer dials for the fine-tuned control they offer, a dial alone doesn't make a great blender—in fact, none of our top picks in the end were dial-controlled models. In our tests, all the models created vortices with a jar full of soup. But a few blenders struggled to produce a good vortex when making a small batch of mayo, because even their slowest speeds were too fast for the job. Most blenders can crush ice, but the better ones yield a consistent, snowy texture, without the nuggets of ice seen here. We tested how well each blender pulverized a pile of ice. For grown-ups, the ability to crush ice allows you to make smooth frozen margaritas entirely in your blender, so you don't have to shell out for a unitasking frozen-drink machine. Kids (and who are we kidding—probably a lot of adults, too) might look forward to homemade snow cones, since some of the better blenders can turn ice into snow. To push the blenders, we filled each jar with about one quart of ice cubes. We ran them on high speed (or used the ice-crushing preset, if available) for 30 seconds, then dumped the ice onto a sheet tray to examine it for consistency. We used tampers with the blenders that included them. The results varied considerably. One blender left nearly half the ice in large, uncut nuggets (earning a disqualification), while others created powdery snow. The preset on the Cuisinart easily turned out uniformly sized pieces of fine snow. The KitchenAid's button chopped efficiently at first, but near the 15-second mark, ice clung to the jar around the spinning blade, resulting in a few unprocessed chunks mixed in with the fine snow. All the blenders with tampers turned ice into snow in less than 30 seconds without leaving any chunks, proving that a tamper can help achieve more uniform results. Unfortunately, all of the models with tampers fell short in other areas, and thus didn't earn our overall recommendation. To see how well each blender handled puréeing, we blended a butternut squash soup in each one, then tested for consistency with a fine-mesh sieve. One core job of a blender is puréeing chunky ingredients into a smooth soup or sauce. We cooked up a batch of butternut squash soup, leaving the squash in big cubes and the onions and other aromatics thickly cut, since large pieces can be more challenging for some blenders to process. We filled each jar with the simmered vegetables and broth, making sure to add the same proportion of liquid and solid to each, then blended them for a total of one minute. We poured the soup through a fine-mesh strainer before weighing the pulp left behind. The results were extremely consistent from one blender to the next, with each model churning out a smooth soup. The most refined soup, from the commercial-style, three-and-a-half-peak-horsepower Waring, left less than a gram of pulp behind, while the Breville left nine grams' worth of large squash strands. (That may sound like a lot, but given that each blender jar started with 1,500 grams of soup ingredients, nine grams of leftover pulp is hardly anything.) Our winning Cuisinart left just three grams of pulp behind, creating a pleasingly smooth soup. With only an eight-gram difference between the best and worst, we didn't notice much of a discrepancy in performance in this test, especially considering that each blender held enough soup to feed four to six people. After blitzing together kale and mango smoothies, we pressed the pulp through a fine-mesh strainer and weighed what was left behind. For our second purée test, we used each blender to combine roughly torn kale, frozen mango, yogurt, ice, and water into a smoothie. We counted how many 30-second bursts each machine needed to bring the ingredients together. Then, once they were combined, we blitzed them all at high speed for another minute, just to give the blenders extra time to process the fibrous kale. Finally, we poured the smoothie through a fine-mesh strainer and weighed the pulp left behind. From the ice-crushing test, we had learned that the tampers help by pushing ingredients into the blade, so for our smoothies, we didn't use the tampers during the first 30 seconds, to see if it made a difference. We did use them for the next 30 seconds, just to give the blenders that came with tampers a chance to show what they could do. The results were split. Some machines, like our winning Cuisinart and KitchenAid, blended the drink in 30 seconds with nothing but consistently tiny flecks of kale left behind. (Mind you, with a high-powered blender, you can reduce the kale so thoroughly that its cells rupture and leak chlorophyll into the drink, tinting the whole thing green, with no flecks remaining.) Other models left larger pieces of kale after the same amount of time, and required more time to break it down fully. None of the models that came with tampers seemed like they needed the help to move things along. After weighing the pulp, we found that the Cuisinart had left behind the smallest amount (eight grams), while other models had left as much as 50 grams—enough to give the smoothie an unpleasant texture (and probably get some kale stuck in your teeth). Some blenders had no trouble creating a thick frozen drink, but others left bits of gritty pineapple behind. For our last (and most anticipated) purée test, we blended up piña coladas using a frozen base of coconut cream, sugar syrup, and pineapple, along with ice. After combining the ingredients in each machine at high speed (or using the fastest preset available), we sampled each, noting the consistency of the blend and how thick the mixture was as we poured it into cups. The key here is thickness: You want a thoroughly blended frozen drink, with no icy chunks, but you also want a thick pour straight out of the jar, since the drink will only grow thinner as the ice melts. Blenders that don't process frozen ingredients well require longer blending times, but longer blending means more friction in the jar. More friction equals more heat, and more heat leads to a prematurely melted drink. Nobody wants that. All the machines were able to break down the frozen ingredients, but the smoothness of the drink after 30 seconds varied. The Cuisinart produced a smooth drink that was just a hair thinner than we wanted; given that it processed the drink so well, we're confident that a properly thick frozen cocktail can be made in it by reducing the blending time to less than the 30 seconds we tested. (In this test, the Cuisinart was arguably too good of a blending beast, finishing its task ahead of time and generating nothing but friction and heat after that.) Other machines either took longer than 30 seconds to fully process the cocktails, leading to inevitable melting, or left chunks of unprocessed fruit behind. To test each blender's ability to emulsify oil and water, we made mayonnaise using one large egg and one cup of oil, along with mustard, lemon juice, and garlic. With each blender on high speed, we slowly streamed the oil in and watched for the thick sauce to come together. Results were mixed. Some machines made a thick and creamy mayo easily. A few turned the egg and oil into a greasy soup, never forming a proper emulsion. The Cuisinart did well at the task, but required an extra quarter cup of oil to fill the jar sufficiently for the blades to do their thing. As we blended in, emptied, and washed the machines, we noticed which details made certain models more user-friendly and which frustrated us. As mentioned earlier, an intuitive dashboard is important—if the blender is easy to use, you're more likely to leave it out and put it to work. The simplest set of controls includes a dial and a pair of toggle switches, but lacks presets. On the other hand, if the dashboard is loaded up with presets, it can become a dizzying array of options—for instance, the fact that the KitchenAid's "stir" and "mix" buttons correlate to different speeds isn't very clear. The Breville and Cuisinart come with built-in timers, which we like, but the Breville shuts the machine off after 60 seconds (to protect the motor), and that can be annoying for more time-intensive blending tasks. Some of the more pro-styled blenders we tested rise more than 18 inches tall, which is the space most home cooks have between the countertop and upper cabinets. Our winners are shorter than 18 inches and will fit on most countertops. Cord length, which varied from 32 1/2 to 71 inches, could be a concern for those with a limited number of outlets (though, on the other hand, safety issues increase as a blender's electrical cord grows longer). Unfortunately, blenders are all still pretty loud, which we tested with a decibel meter app. The quietest one, the KitchenAid, clocked in at 80 1/2 decibels, so don't expect to make any stealthy early-morning smoothies while the family is asleep. After we tested the blenders, it was clear to us that most could tackle occasional puréeing of soups or sauces and, with some tweaking of oil quantity, pull a mayonnaise together. The tests that set them apart were the ones that called for processing more difficult ingredients, like fibrous vegetables, hard ice, and other frozen items. Our top pick did well across all tests, beating out higher-priced machines with larger motors. For about $40 less at the time of writing, our budget pick is a solid choice for home cooks who need a basic blender for mayo and puréeing simple soups and sauces. What we liked: While we tested models that cost $100 more and ones with larger motors, none of those bested the Cuisinart. It turned ice into a uniform snow, puréed soup well, made the smoothest smoothie, and fell just shy of a beautifully thick piña colada (though, with some adjustment in blending time, we're confident it can do the job perfectly). We like the Cuisinart's timer, which counts the seconds as you blend or can be set to shut off after a specified amount of time. The dashboard is a mix of presets, including smoothie and ice-crushing task buttons and pulse, high-speed, and low-speed buttons. The timer works two ways: It counts the seconds as you blend, or you can program it to shut off after a set amount of time, up to one minute. The jar has markings along the side for the max volume of soapy water you should add to buzz the blades clean after using. What we didn't like: Making mayo required more than the one cup of oil our recipe calls for (though our recipe is formulated for a stick blender). While the Cuisinart, at 17 1/4 inches tall, is compact enough to fit under most upper cabinets, the power cord is a skimpy 32 inches long, which can be restrictive. The 88 decibels we measured makes this blender one of the loudest ones we tested. What we liked: This KitchenAid blender cost just over $125 at the time of testing, but it held its own against more powerful and pricey machines. It can produce consistently crushed ice—though you might have to get in there with a spatula between pulses to rearrange things—and it was one of the only models to make a one-egg/one-cup-of-oil mayo with no need for extra oil. The KitchenAid will handle daily puréeing, but you should expect to process stringy vegetables for a little longer to get a silky consistency. This blender, which comes in 21 colors, also has one of the easiest jars to pour from, because of the built-in spout. What we didn't like: This was the quietest machine we tested, which KitchenAid attributes to a plastic-covered metal gear on the bottom of the jar that keys into the motor. We've read some reviews that describe the plastic wearing away, rendering the blender useless. We'll keep an eye on this in our test kitchen as we use the KitchenAid more, and update this review if we notice any wear issues. We also had to work the ingredients down into the KitchenAid with a spatula while making piña coladas. The Waring Xtreme Hi-Power was the most expensive blender we tested, but it failed to emulsify egg and oil into mayo, no matter how hard we tried. The Waring Xtreme Hi-Power is also a monster in size—the heaviest model we tested, at more than 14 pounds, and nearly the tallest, at 18 1/2 inches—so it's not really countertop-friendly. The Cleanblend had the highest-wattage motor of the models tested (1,800 watts), but it didn't blow us away. The dashboard includes a variable-speed dial and a pulse switch, but for the price, we'd expect better smoothie results. While the manufacturers haven't confirmed it, the Cleanblend and the Salton Harley Pasternak Power Blender look to be made in the same factory, though the Salton has a slightly smaller, 1,500-watt motor. These two models have the same smart cord-management system built into the base, which is good, considering that the power cords on both are around 50 inches long. On two separate occasions during testing, the Oster seized up on us, which we assume it did to protect the motor. That might be understandable if we were attempting to turn peanuts into peanut butter, but for the basic tasks we were testing, we'd expect better. This model also required extra effort to emulsify mayo. On the plus side, it has one of the more user-friendly dashboards, with a mix of presets and a variable-speed dial. We also like the safety feature that allows users to turn the blender on only once the jar is properly seated. There's a lot to like about the Breville, including great performance on the mayo test and in much of the purée testing. The jar is one of the easier ones to clean, thanks to the round shape. A built-in timer helps keep track of your work, while a sensor in the base knows when the jar is properly seated and prevents the motor from accidentally turning on when it's not. But this model left a lot of kale pulp behind during the smoothie test, and the Breville's lid is also the most difficult to remove. While it has the smallest jar of all the models, the Hamilton Beach punches above its weight. It did well for the most part, but left behind the second-largest amount of kale pulp in our smoothie test. The Hamilton Beach is billed as a quiet blender, thanks to a secondary cover that fits over the jar, yet we found three other models that ran quieter in our testing. We like the variable-speed dial, the large pulse button, and the preset options, but wish it had a larger jar. The Braun was the only model to feature a glass jar, if blending in plastic is a concern for you. However, we disqualified it after it failed to crush ice. While we didn't test the Ninja Professional for this review, Kenji vetted it for our original high-end-blender review, and the results left enough to be desired that we didn't feel the need to test it again. Sal Vaglica is Serious Eats' resident equipment expert. A former senior editor at This Old House magazine, he has covered food, gear, and gardening for the likes of Saveur, the Wall Street Journal, Wired, Men's Health, Better Homes & Gardens, and Men's Journal. He spent summers manning the ovens of his family's Queens pizzeria before working at a German bakery for a couple of years after high school. He's really into barbecuing, grilling, and most things crunchy or acidic.